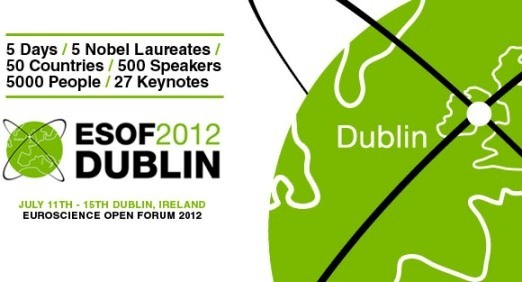 ESOF 2012 - Can You Feel The Buzz? It's less than 24 hours to the opening ceremony of Europe's largest general science meeting - the Euroscience Open Forum or ESOF. Unless you've been hiding under a rock for the past year, you will of course know that this year's event takes place in Dublin (at the Convention Centre) and the city has relabelled itself a 'City of Science'. To coincide with the conference, there is also a week long Festival of Science taking place on the streets of the capital and, to a lesser extent, in some towns and cities around the country. However, it is the conference itself which has me very excited. As a teacher in a seven boarding school, I don't get out much! This is particularly the case when it comes to science conferences, lectures, panel discussions and workshops. For such a massive event to be taking place in Dublin, it offers a chance for my inner geek to go wild. And wild it will go. I plan on spending most of the next five days in the Convention Centre, soaking up the best that Irish and European science has to offer. The line-up is incredibly impressive, with speakers and events focusing on a range of topics, such as science careers, education, communicating science, science culture, science engagement, policy, the climate and medicine & health. I'll be blogging from the conference so look out for reports on my favourite speakers and the workshops which grabbed my attention. If you are attending I would recommend using the personalised schedule on the ESOF website (that's mine below) which allows you plan your few days and keep track of where you are supposed to be. I'm particularly looking forward to Jules Hoffman on European research on immune diseases, an interview with James Watson, Marcus du Sautoy on the secret mathematicians, Craig Ventor on what is life?, Brian Greene on the state of String Theory, Rolf-Dieter Heuer on the Large Hadron Collider and Jocelyn Bell Burnell on why we are star dust! It's going to be a frantic fun few days! See you there! Science in the City Festival Kicks Off!